The response followed US’ claims that China has nearly finished building several structures on artificial islands in the South China Sea. Rejecting the contention of the United States that China is building structures on the South China Sea Islands to house long-range surface-to-air missiles, the country's foreign ministry said on Wednesday that no country could question Beijing's right over the South China and its adjacent waters. Chinese foreign ministry spokesman Geng Shuang told media, "We have seen these reports. China has indisputable sovereignty over Nanhai Zhudao (South China Sea) and the adjacent waters. China firmly safeguards its territorial sovereignty and maritime rights and interests." "Meanwhile, we are always committed to resolving relevant disputes in a peaceful way with countries directly concerned through dialogue and consultation and to collectively maintaining peace and stability of the South China Sea with ASEAN countries," he added. "I want to reiterate that China carrying out normal facility construction, including deploying necessary and appropriate national defence facilities, on its own territory, is exercising a right bestowed by international law to sovereign states,” Shuang said. Also adding that the concerted efforts made by China and ASEAN countries have improved the situation in the South China Sea, he said, “We hope that non-regional countries can truly respect the efforts made by regional countries and do more for regional peace and stability." China's response came after Washington claimed that Beijing has nearly finished building almost two dozen structures on artificial islands in the South China Sea that appear designed to house long-range surface-to-air missiles. The South China Sea carries a third of the world's maritime traffic. Apart from China, Brunei, Malaysia, the Philippines, Taiwan and Vietnam also have also staked a claim to these waters. The Donald Trump administration has described China's island building in the South China Sea as illegal. A Pentagon spokesman said the United States remained committed to "non-militarization in the South China Sea" and urged all claimants to take actions consistent with international law. In a move likely to stoke tensions in the region, China has built new structures to potentially house surface-to-air missiles on three of its artificial islands in the South China Sea, but so far no missiles have been sent there, two U.S. officials confirmed to Fox News. The news comes as the U.S. Navy deployed an aircraft carrier to the South China Sea during the weekend -- the first time since President Trump took office. China has built runways on Subi, Mischief and Fiery Cross islands, built atop former reefs in the Spratly chain of islands. China has constructed 24 new buildings across these three islands in the past few months, according to the officials. Recent U.S. satellite imagery showed that each structure is 11-by-22 yards in length, according to one official. The buildings have retractable roofs. Surface-to-air missile systems don’t need to be covered or housed, but the new buildings likely will help conceal the missiles should they arrive and also protect them from the salt air, one official said. Fox News exclusively reported on Dec. 24 that China had amassed hundreds of surface-to-air missiles on Hainan island just off the mainland for training, and intelligence officials believe they could be sent to China’s man-made islands next. So far, though, none of the missiles have been shipped south to the artificial islands, according to officials. U.S. officials said they are also seeing signs that Russia is preparing to deliver advanced SA-21 launchers to China, which could one day end up on the artificial islands. Secretary of State Rex Tillerson, in his confirmation hearing in January, told lawmakers China should be denied access to its artificial islands in the South China Sea. Over the weekend, the aircraft carrier USS Carl Vinson and her strike group patrolled in the South China Sea, conducting what the Navy called “routine operations.” A few hours ago, the U.S. Pacific Command tweeted photos showing a U.S. Air Force B-1 bomber flying in formation with F/A-18 Hornets over Vinson in the South China Sea. On Tuesday, a Chinese military spokesman said he opposed the presence of the American aircraft carrier in the region. "We are consistently opposed to relevant countries threatening and damaging the sovereignty and security of littoral countries under the flag of freedom of navigation and overflight," Chinese foreign ministry spokesman Geng Shuang said at a news briefing according to Reuters, the first official comment since the aircraft carrier strike group began its patrol in the South China Sea. Reuters first reported the presence of new buildings on the man-made islands in the South China Sea. The aircraft-carrier strike group led by USS Carl Vinson conducting naval and air operations in the South China Sea this week is the first challenge to Beijing’s expansive maritime claims to the waters since Donald Trump took office. The US Navy announced that the operations began on February 18, describing them as “routine,” while Chinese state media quickly called the warships’ freedom-of-navigation activities a threat to China. A Pentagon official said the naval maneuvers were not freedom-of-navigation but exercises of the kind the US Navy has been doing for a hundred years. It's no longer a matter of if, but when. The Chinese said the U.S. bomber was flying in international airspace. American officials tell Fox News the bomber was flying in international airspace and continued on its mission---albeit without its wingman. Fox News has learned that two B-1 bombers were supposed to launch a patrol from Guam to the Korean Peninsula as part of training exercises with the South Koreans, hours after the failed North Korean missile launch. Only one B-1 bomber was able to take off. The other was scrubbed due to maintenance issues. The Chinese warning came over the emergency radio frequency known as "guard," according to one official. The incident unfolded when the American bomber was flying 70 miles southwest of the South Korean island of Jeju. Meanwhile, Defense Secretary Jim Mattis and Chairman of the Joint Chiefs of Staff Gen. Joe Dunford were addressing lawmakers on Capitol Hill Wednesday about the defense budget and the current readiness crisis facing the U.S. military. A pair of Chinese fighter jets conducted an “unprofessional” intercept of an American radiation-sniffing surveillance plane over the East China Sea, the U.S. Air Force said Friday, the latest in a series of such incidents that have raised U.S. concerns in an already tense region. On Wednesday, the two Chinese SU-30 jets approached a WC-135 Constant Phoenix aircraft conducting a routine mission in international airspace in accordance with international law, Pacific Air Forces spokeswoman Lt. Col. Lori Hodge said in a statement. The WC-135 crew characterized the intercept as unprofessional “due to the maneuvers by the Chinese pilot, as well as the speeds and proximity of both aircraft,” Hodge said. China declared an air defense identification zone over a large section of the East China Sea in 2013, a move the U.S. called illegitimate and has refused to recognize. China has demanded foreign aircraft operating within the zone declare their intentions and follow Chinese instructions. Hoge declined to say whether Wednesday’s incident was within the self-declared Chinese zone. Unexpected and unsafe intercepts involving U.S. and Chinese military aircraft have occurred occasionally over the South China Sea, which China claims virtually in its entirety. Although China says it respects freedom of navigation in the strategically vital area, it objects to U.S. military activities, especially the collection of signals intelligence by U.S. craft operating near the coast of its southern island province of Hainan, home to several military installations. In recent years, the sides have signed a pair of agreements aimed at preventing such encounters from sparking an international crisis, as happened in April 2001 when a Chinese jet fighter collided with a U.S. surveillance plane over the South China Sea, leading to the death of the Chinese pilot and China’s detention of the 24 U.S. crew members for 10 days. Three Australian warships were challenged by the Chinese military as they travelled through the disputed South China Sea earlier this month, the ABC can reveal. 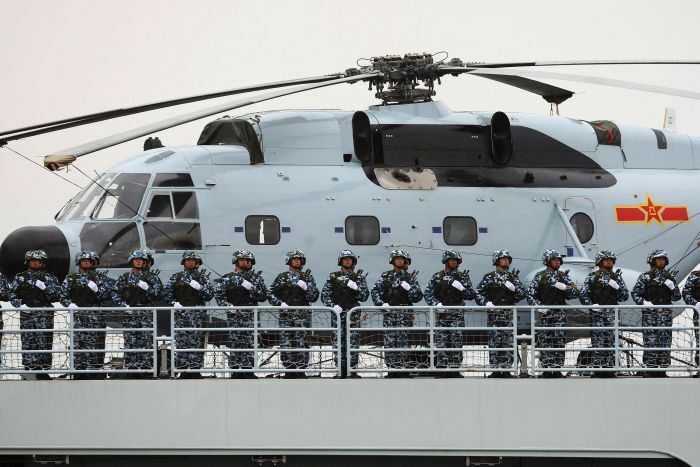 The confrontations with the People's Liberation Army are believed to have occurred as China was conducting its largest ever naval exercises in the hotly contested waters. Defence sources have confirmed HMAS Anzac, HMAS Toowoomba and HMAS Success were challenged by the PLA Navy as they were transiting towards Vietnam where they are now conducting a three-day goodwill visit in Ho Chi Minh City. One official, speaking on the condition of anonymity, insists the exchanges with the Chinese were polite, but "robust". 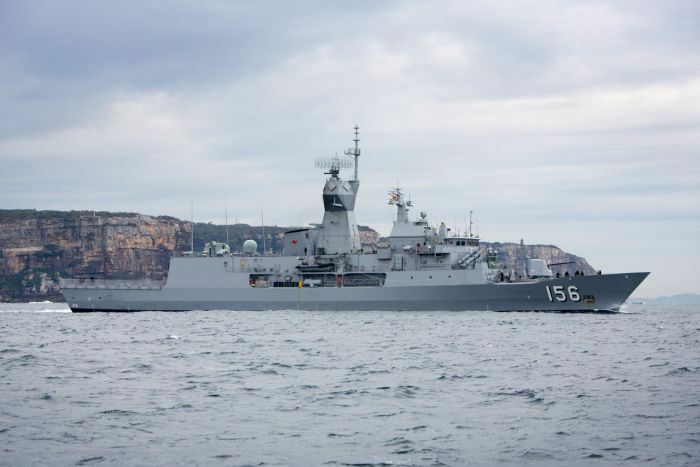 The Defence Department has refused to answer questions or discuss details of the interactions between the Australian warships and the Chinese military. In a statement it has confirmed HMAS Anzac and HMAS Success recently travelled through the South China Sea after leaving Subic Bay in the Philippines, while HMAS Toowoomba also went through the disputed waters after departing from Kota Kinabalu in Malaysia. "The Australian Defence Force has maintained a robust program of international engagement with countries in and around the South China Sea for decades," the department told the ABC. "This includes bilateral and multilateral military exercises, port visits, maritime surveillance operations and ship transits." Prime Minister Malcolm Turnbull would not confirm the incident but reiterated Australia's right to conduct freedom of navigation exercises in the area. "We maintain and practice the right of freedom of navigation and overflight throughout the world, and in this context, naval vessels on the world's oceans including the South China Sea, as is our perfect right in accordance with international law," he said. Defence Industry Minister Christopher Pyne also reiterated Australia's rights within international law and downplayed the seriousness of the incident. "I think 'confrontation' is somewhat of a tabloid-style description of what goes on in the South China Sea very regularly," he said. During their port visit to Ho Chi Minh City, HMAS Anzac, HMAS Toowoomba and HMAS Success will conduct a logistic resupply and local engagement with Vietnam People's Armed Forces and local government officials. Earlier this month, Beijing boasted of the largest-ever military exercises by the Chinese navy in the contested South China Sea. In the rare display, China brought much of its naval hardware for the world to see — 10,000 personnel, 76 fighter jets, 48 naval vessels, a nuclear powered submarine and China's first aircraft carrier. China has quietly installed anti-ship cruise missiles and surface-to-air missile systems on three of its fortified outposts west of the Philippines in the South China Sea, a move that allows Beijing to further project its power in the hotly disputed waters, according to sources with direct knowledge of U.S. intelligence reports. Intelligence assessments say the missile platforms were moved to the outposts in the Spratly Islands within the past 30 days, according to sources who spoke on the condition of anonymity. The placement of the defensive weapons also comes on the heels of China's recent South China Sea installation of military jamming equipment, which disrupts communications and radar systems. By all accounts, the new coastal defense systems represent a significant addition to Beijing's military portfolio in one of the most contested regions in the world. The United States has remained neutral – but expressed concern – about the overlapping sovereignty claims to the Spratlys. "We have consistently called on China, as well as other claimants, to refrain from further land reclamation, construction of new facilities, and militarization of disputed features, and to commit to managing and resolving disputes peacefully with other claimants," a Pentagon official told CNBC when asked about China's recent military activity in the area. "The further militarization of outposts will only serve to raise tensions and create greater distrust among claimants." The recent intelligence, according to sources, indicates the deployment of anti-ship cruise missiles and surface-to-air missiles on Fiery Cross Reef, Subi Reef and Mischief Reef in the Spratly Islands. The Spratlys, to which six countries lay claim, are located approximately two-thirds of the way east from southern Vietnam to the southern Philippines. The land-based anti-ship cruise missiles, designated as YJ-12B, allow China to strike surface vessels within 295 nautical miles of the reefs. Meanwhile, the long-range surface-to-air missiles designated as HQ-9B, have an expected range of targeting aircraft, drones and cruise missiles within 160 nautical miles. The defensive weapons have also appeared in satellite images of Woody Island, China's military headquarters in the nearby Paracel Islands. "Woody Island serves as the administrative and military center of China's presence in the South China Sea," Gregory Poling, Center for Strategic and International Studies fellow and director of the Asia Maritime Transparency Initiative, told CNBC in a prior interview. "We assume that anything we see at Woody will eventually find its way farther south to more directly menace China's neighbors," he added. The South China Sea, which is home to more than 200 specks of land, serves as a gateway to global sea routes where approximately $3.4 trillion of trade passes annually. The numerous overlapping sovereign claims to islands, reefs and rocks — many of which disappear under high tide — have turned the waters into an armed camp. Beijing holds the lion's share of these features with approximately 27 outposts peppered throughout. Beijing's interest in developing the crumbs of land across the South China Sea is by no means new. For instance, China first took possession of Fiery Cross Reef and Subi Reef in 1988 and has since outfitted the features with deep-water ports, aircraft hangars, communication facilities, administration offices and a 10,000-foot runway. Last week, U.S. Navy Adm. Philip Davidson, the expected nominee to replace U.S. Pacific Command Chief Adm. Harry Harris, described China's increased presence in the South China Sea as "a substantial challenge to U.S. military operations in this region." In written testimony to the U.S. Senate Armed Services Committee, Davidson said the development of China's forward operating bases in the hotly contested waters appear to be complete. "The only thing lacking are the deployed forces. Once occupied, China will be able to extend its influence thousands of miles to the south and project power deep into Oceania," Davidson wrote. "In short, China is now capable of controlling the South China Sea in all scenarios short of war with the United States." Davidson's comments echo a steady drumbeat of warnings made by Harris regarding China's growing strength. Earlier this year, Harris told Congress that Beijing's impressive military buildup, including its pursuit of hypersonic weapons, could challenge the United States "across almost every domain." "While some view China's actions in the East and South China Seas as opportunistic, I do not. I view them as coordinated, methodical and strategic, using their military and economic power to erode the free and open international order," Harris told the House Armed Services Committee. Harris, whom President Donald Trump is reportedly set to nominate as U.S. ambassador to South Korea, currently oversees approximately 375,000 military personnel and is responsible for defending a theater that spans nearly half of the Earth's surface. "Ladies and gentlemen, China's intent is crystal clear. We ignore it at our peril," Harris said. Through its navy, coast guard, a loose collection of armed fishing vessels, and a network of military bases built on artificial islands, Beijing has gained de facto control of the South China Sea, a panel of Indo-Pacific security experts said Friday. And the implications of that control — militarily, economically, diplomatically — are far-reaching for the United States and its partners and allies in the region. “Every vessel [sent on a freedom of navigation transit] is shadowed” by a Chinese vessel, showing Beijing’s ability to respond quickly events in areas it considers its own, retired Marine Lt. Gen. Wallace “Chip” Gregson said during an American Enterprise Institute forum. Gregson added that U.S. freedom of navigation operations do little to protect American maritime rights, or the right of allies like the Philippines, Vietnam and Brunei. The challenge over control in waters claimed by many other nations in addition to China has to be managed. Otherwise, U.S. allies will be reluctantly pushed to work with China because there is no steady American presence across the board in this key part of the globe. To see how much has changed recently, all the panelists said look to what leaders are saying now about China’s aspirations. Cliff said the Chinese armed forces are expanding to include large-deck carriers, destroyers the size of U.S. Aegis guided-missile cruisers, more submarines, a strategic bomber and airlift force. Research into hypersonic and laser weapons was viewed in China as a complementary element in a strategy to project “political influence in regional and world affairs” beyond its membership on the U.N. Security Council. Xi has stressed the importance of a campaign to exert “cultural influence outside Asia,” as it did into the mid-19th century and Japan does now. At the same time, it is flashing its economic strength through the Asian Pacific Investment Bank, which has attracted traditional American allies like Thailand and the Philippines, and its “One Belt/One Road” initiatives in building and controlling infrastructure from highways to dams to ports in programs stretching from Asia into Africa, Europe and the Caribbean. Gregson termed the decision to pull the United States out of the Trans-Pacific Partnership “a very damaging blow” as it opened ways for China to fill a trade and investment gap with the bank and infrastructure initiatives. He added the imposition of tariffs on allies most recently over steel and aluminum as creating more rifts in what should be stable relationships with nations who have shared goals. The way the Chinese see it, only one nation could block them from reaching those goals, and that is the United States, he said. “The United States was going to have to work harder and smarter” to compete with China, Nathan Freier, of the Army War College, said. He called for more concrete action than “its two half-hearted rebalances” toward the Pacific under the administrations of George W. Bush and Barack Obama. Thomas Donnelly, of the American Enterprise Institute, said, the United States is “missing an opportunity to impose cost on China,” particularly for its territorial assertiveness. “It is a global competition [with its] principal theater East Asia maritime.” He added current U.S. strategy does not address that point well enough. The planned June 12 summit between President Donald Trump and North Korean leader Kim Jong-un later this month or in the future has created a new dynamic in relations among American allies in the Pacific and with China. During the panel discussion, he mentioned that China also has viewed the Korean Peninsula “as being part of the first island chain” where it can and does exert its greatest influence, Donnelly said. Gregson said that initially the United States defense perimeter in the Pacific after World War II did not take in Korea. The result of that miscalculation was the invasion of South Korea by Kim’s grandfather and later Chinese intervention in the war. For Trump, Freier said the president needed to be very careful in discussing American troop levels in Korea and joint exercises during the negotiations, regarding them as more than bargaining chips. Likewise, the president also needed to realize that reaching an accord with Kim on intercontinental ballistic missiles threatening the United States does not lessen Pyongyang’s ability to strike Japan with shorter-range missiles — a continuing security concern in Tokyo. “We are in grave danger of a fraying relationship” with important allies,” he said. The time is now for the United States “to make a choice” and “push our chips to the center of the table” in containing China and maintaining a stable Indo-Pacific, Freier said. The panelists said dropping China from the invited nations to the Rim of the Pacific exercises was a step in the right direction but not a be-all and end-all in ending China’s bullying of its neighbors in a host of ways. Donnelly added, “We’re not a status quo power,” and one of the reasons East Asia is so economically prosperous now and militarily quiet is “we infused our political values into [these] societies,” citing the democracies in Japan, South Korea and Taiwan. “They are very different societies than before we began interacting with them day-by-day,” he said. A video from late May 2018 shows a swarm of 56 small, unmanned boats operating in the South China Sea. While a rudimentary demonstration, it mirrors similar exercises performed by U.S. Navy boats practicing — semi-autonomously — to defend harbors and intercept incoming vessels. The Chinese robo-boats do not appear to be armed, but the company behind it — Yunzhou Tech Corporation — revealed an armed unmanned boat at a Beijing “Civil-Military Integration Expo” in July 2017. The show focused on cutting-edge technologies that China believes could provide an “asymmetric” advantage in a conflict with the United States. Meaning, cheaper technologies and tactics that allow a weaker adversary to exploit unanticipated weaknesses in a more powerful opponent. If the at-sea demonstration is any sign, those capabilities are developing. The expensive and difficult portion of a robotic swarm is the technology you can’t see — the networks and algorithms that allow machines to work together and avoid obstacles. The boats themselves are cheap. Once you figure out the mathematical problems, then it’s a simple matter of arming each of those small boats with rockets and missiles and sending them after a $1 billion cruiser. Like a swarm of mosquitoes, the cruiser can’t swat them all away before one draws blood. However, the Chinese military is not entirely sold on the concept, as there are more conservative-minded generals who prefer the People’s Liberation Army focus on improving and expanding its conventional, and established, military forces — warships, fighter jets and missiles — as opposed to taking risks on largely untried technology. But Chinese companies are still developing drones, and the armed Wing Loong — similar to the U.S. Predator — has proliferated to Africa where it has seen combat . A more anodyne set of examples of developing Chinese drone tech are the dancing displays of networked machines taking to the skies during public events. Rear Admiral Lou Yuan is deputy head of the Chinese Academy of Military Sciences. In his speech, he said there were ‘five cornerstones of the United States’ open to exploitation: their military, their money, their talent, their voting system — and their fear of adversaries. It’s not the controversial commentator’s first aggressive outburst. And its part of a steadily escalating war of words between the two nations. Earlier in December, the Chinese state-run Global Times published the views of a panel of such ‘military commentators’ concerning Beijing’s sovereignty claims over Taiwan and the East and South China Seas. “If the US naval fleet dares to stop in Taiwan, it is time for the People’s Liberation Army to deploy troops to promote national unity on (invade) the island,” Admiral Lou said. It was just one of a string of similarly hawkish views. 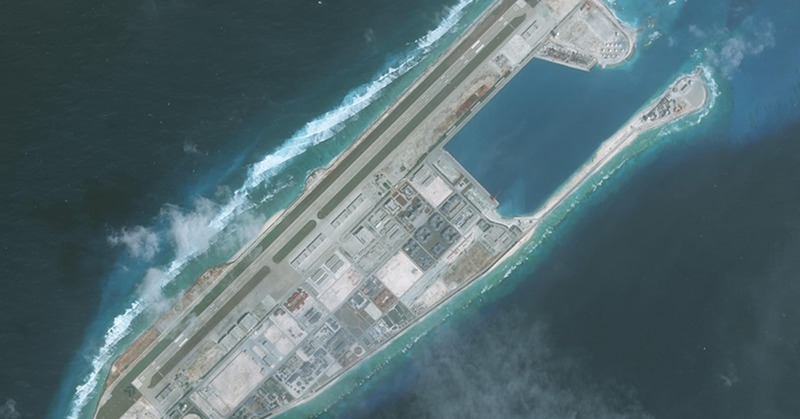 Beijing has annexed several reefs in the South China Sea, engaging in an enormous geo-engineering project to build artificial islands upon which it has placed heavily fortified airfields and ports. The United States’ enormous aircraft carriers are considered the centrepieces of its navy and highly visible embodiments of that nation’s power. At $US8.5 billion ($A12 billion) each, they’re also a huge economic investment. And questions have been growing over their continued relevance to modern warfare. As with the ‘gunboat diplomacy’ of huge armoured and heavily gunned battleships before World War II, some military analysts technological advances have made these ships obsolete. Once, aircraft carriers were able to project military might (through their aircraft) while unseen and outside the reach of defences. Now, with modern satellite and over-the-horizon radar systems, they can no longer rely upon being unseen. And land-based missiles potentially out-reach their aircraft — forcing carriers to move into ‘danger zones’ before they can be effective. But heavily networked radars, decoys and antimissile systems aboard the aircraft carriers themselves and their escorts are believed capable of warding off attacks from current-generation missiles. However, both China and Russia have claimed they are rapidly bringing into service a new generation of hypersonic weapons which simply move too fast to counteract. Hmm. This guy is a real bright bulb. Sink two capital ships. Yeah, we would just let that happen. I don't think we'd let it happen without reprisal but, I also don't think we'd turn China into a nuclear cinder over it like some people think we'd do. After 9/11 we were in a place nationally to turn Afghanistan into glass, and we probably should have to send a message but, I think that's only because it happened right in our backyard. A carrier or two getting sunk, literally across the world, I don't think would carry the same impact to the nation as watching the WTC towers collapse on live TV. I could be wrong but it's not a situation I'd bet money on. Something else I've seen talk of but haven't hunted down source material of is China saying they're going to wait until the US has weak Dem leadership again, like we will surely have at some point, before they take any action.